The Massachusetts Butterfly Club sponsors state-wide butterfly activities to promote education, conservation, interpretation, and fun! We invite people of all ages and levels of expertise to attend our meetings, programs, field trips, and butterfly counts and to become members of our club. The Arlington�s Great Meadows field trip scheduled for Sunday, April 21st has been rescheduled to Sunday, April 28th at 11am. The field trip and July count schedules for 2019 have been posted to the website. Click on 2019 Schedule on the left menu. The 2019 Spring meeting of the Massachusetts Butterfly Club was held at Massachusetts Audubon�s Broad Meadow Brook Sanctuary in Worcester on Saturday, April 13th. The Spring Journals were delivered to all present at the meeting. The others have been mailed. If you do not receive your copy by the end of April, contact Barbara Volkle at barbara@massbutterflies.org. To see a write-up and photos, use the left menu "Club Information" "Past Club Events" or click here. We still have a few official Massachusetts Butterfly Club HATS and T-SHIRTS available for purchase. They are on sale for $20 each. 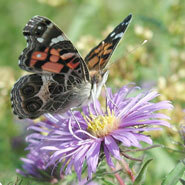 Sign up to get e-mail from Massachusetts butterfly enthusiasts! If you wish to receive periodic e-mail messages about butterflies in Massachusetts and to report your own butterfly sightings, consider joining the MassLep list server. Butterfly watchers from around the state send messages listing the butterflies they see, describing butterfly behavior, posing questions, and answering them. Joining the list server is a great way to find out what's flying and to get to know others who share your interests! If you have problems with subscribing or unsubscribing to the MassLep list server, send an email to the list server monitor. North American Butterfly Association Inc (Massachusetts Chapter). Send your suggestions to our webmaster.